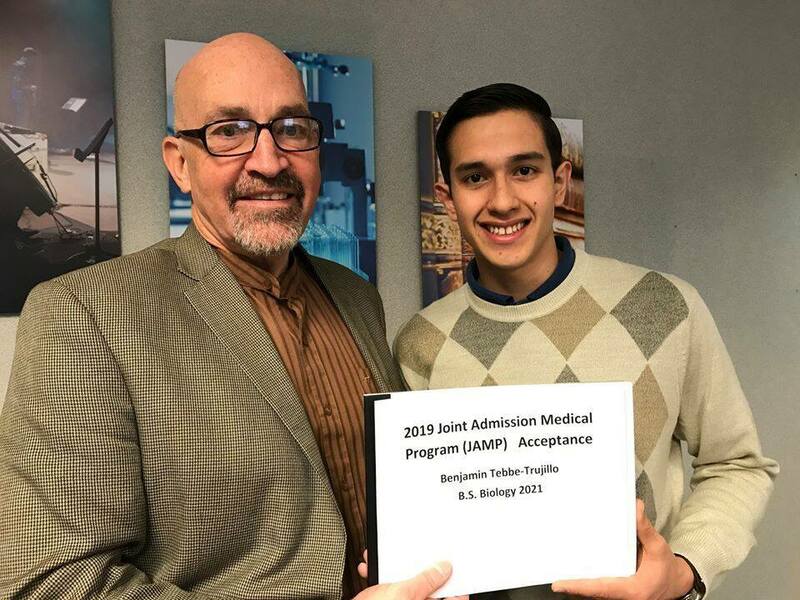 LeTourneau University sophomore biology major Benjamin Tebbe-Trujillo has been accepted to participate in the Texas Joint Admission Medical Program (JAMP) which guarantees him acceptance into one of the nine medical schools in Texas once he completes his undergraduate degree at LETU. The JAMP award enables him to begin his medical school education this summer with his first medical school internship. Housing and a stipend will be provided while he learns. The program also helps with mentoring and personal assistance to prepare for medical school. Once he completes his remaining requirements of the JAMP program, he will have interviews at all nine of the medical schools in Texas, with guaranteed acceptance into at least one. Tebbe-Trujillo grew up a missionary kid in South America where he saw great need in healthcare overseas, which encouraged him to pursue a career as a medical doctor. “Traveling extensively opened my eyes to both the lack of competent doctors and the impact on countless lives a committed doctor can have,” Tebbe-Trujillo said. While in high school in Peru, Tebbe-Trujillo translated for American doctors during a short-term clinic. That experience introduced him to the routine of a doctor, and he began to see patients not as problems, but as individual persons needing help. “Switching between languages and reading cultural cues on both sides challenged me daily, but the reward of bringing down communication barriers to improve peoples’ lives motivated me to continue,” Tebbe-Trujillo said. “The fears, questions, and struggles of the men, women, and children with whom we spoke deserved the same attention and care given to their physical needs. Created by the Texas Legislature in 2001 and funded through the Texas Higher Education Coordinating Board, JAMP was designed to support and encourage highly qualified, economically disadvantaged students to pursue medical degrees. Medical schools include Baylor College of Medicine; Texas A&M University, College of Medicine; Texas Tech University Health Sciences Center, School of Medicine in Lubbock; Texas Tech University Health Sciences Center in El Paso; the University of North Texas Health Science Center/Texas College of Osteopathic Medicine; The University of Texas Health Science Center at Houston – McGovern Medical School; Long School of Medicine, University of Texas Health Science Center at San Antonio; The University of Texas Medical Branch at Galveston; and the University of Texas Southwestern Medical Center at Dallas.